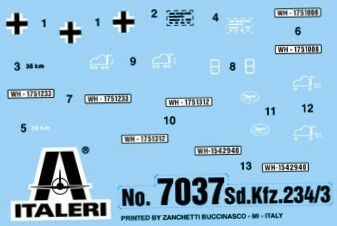 After probing the market with the re-release of the venerable Esci kits, Italeri is slowly expanding its range with its own new releases. This is one of them. It must be said however that Italeri does not envisage competing with the high end of the market and even explicitly markets these kits for the wargaming community. While this means that some kits (like this one) can be built with simplified parts or the more detailed ones, it does not mean that al of these kits are sub-par, as for instance the Hat Armourfast range. They can, by all means, be built into competition models with some loving care. Note that much of the comments Doug Chaltry made about its sister kit, the Sd.Kfz. 234/2 also applies to this kit and vice versa. You can choose between two representations of the suspension. One that imitates the real suspension (although a bit simplified with respect to, for instance, the Hasegawa or MarS offering), and one that only contains a sturdy axle. The latter is meant for wargamers and allows the wheels to turn. The latter options does not allow for the typical toe-in of the wheels (when seen from head-on) . De gustibus non est disputandum, but I quite like the wheels in this kit. If you don't, you can find relief (never mind the pun) in the Attack set 72331. Doug mentions that the Sd.Kfz. 234/2 kit has wheels with the late style thread pattern, but that the hubs are a little suspect. This, of course, carries over to this kit. The interior is very much simplified with only vague representations of the real interior. Some very difficult sanding will be needed on the floor panel to fill the locating holes of the suspension that show through. This succinct interior is OK for the Sd.Kfz. 234/2, but is not so nice with this open topped vehicle. You can either scratchbuild, buy another brand's kit or carefully position some crew figures (which is the option I retained as I was going for a quick-build). The superstructure comes in a bottom and top half and the fit is not super at the apex. The vision flaps (Sehklappe) are molded on the hull and have no vision slits. These can be added with a very sharp blade and a steady hand. The lower hull has no upward opening doors between the middle wheels. If you require, some plasticard or scribing might improve this area. The emergency exit on the nose is a raised panel, while (as far as I know) it should be flush. The lifting eyes around the hull are mere nubs. You can replace them with copper wire, or, when in a rush, just punch holes into them and round off the corners. At the rear of the fighting compartment a very rough representation of an AA mount is provided. Again Doug mentions that the dimensions of the hull of the Sd.Kfz. 234/2 kit are very good, so I guess the same goes for this kit. The side bins are of the "standard" type with 4 lids hinged at the bottom. The front and rear bin are boxed in, which is a nice touch. None can be opened without delicate surgery however. The exhaust is the "horizontal half cylinder"-type, which is most likely correct. Most vehicles seen in wartime photographs had the "horizontal half cylinder". A well-known captured example had the "vertical" exhausts however. Discussions I had with fellow modelers during the build did not lead to conclusive evidence whether these "vertical" exhausts were fitted before or after capture, or that they were even ever fitted to any production vehicle at all. Meantime wartime pictures have surfaced that confirm that some late vehicles were actually fitted with these on the production line. Note that the drawings in  might not be correct in this respect, as they show the "horizontal" muffler for all vehicles. The tools are not too bad, and the jack is actually very nice. The width indicators are over-scale, but as a consequence very sturdy. I did not manage to break them off once, which says a lot ! Tow hooks are provided. Most tools and accessories are seperate parts, except the wire cutter and axe, which are molded on the extra side bin. Picture above: Gun assembly with kit provided muzzle. The gun mount is simple, but does the job, more or less. The MG is nice, but the gun itself ruins the look of the vehicle as the business end tapers far too much and looks more like a fire hose. Note that part 4c (a frame) should be angled backwards, which is not indicated on the plan. The underside of the gun recoil housing is open, so you will see the void from a low angle. I actually only noticed it after completing the model and taking pictures. The wheels for the traverse mechanism are sadly missing. The spare wheel is not bad, but the mounting frame is very simple. This remains visible when mounted, so I decided to add a tarpaulin to cover it up. 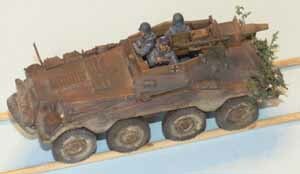 A common mistake with Sd.Kfz.234 kits is the provision for two headlights. Apparently only early 234/2s had two headlights, while all others had one. If so, then I plead guilty to spotting this too late. Building the kit poses no challenge at all, apart from the minor fit problem between the two fuselage halves, as mentioned above. The plastic is quite easy to work with and reacts well to MEK. Positioning of all the tools on the fenders requires some verification, as you do not get locating pegs. Italeri has not forgotten about the typical toe-in of the wheels, but when I tried to glue the wheels in place, I found that the upper edge of the tyres would stick out from underneath the fenders. If I had known this in advance I would have shortened the axles. Being too late for that I chose to glue the wheels vertically, as I guessed this would be the less obvious of two evils. If you choose the "wargaming" wheel assembly you also get no toe-in, but the wheels can rotate. Unknown unit, Normandy, June 1944, licence plate WH-1542940. Overall Dunkelgelb. Unknown unit, Western front, 1944, licence plate WH-1751008. Overall Dunkelgelb. I have no sources available to check for their accuracy. The decals are nice. The white really is white, opaque and sharp. All decals are in perfect register. This is the Sd.Kfz.234 equivalent of a low-cost airline. I bought mine for 5 Euro, which is half the price of the Hasegawa kit (2006 prices), so I am not complaining that some detail is missing, or that some parts are a bit over-scale. It builds very easily and therefore makes for the ideal entry-level AFV. I tried 'speed-building' on it, together with my new airbrush/compressor, a new brand of acrylic paint and some new techniques. I learned a lot from it (for instance, that I should try one new thing at a time), and while I do not have a competition model on the shelf, I am quite happy with it. After all, now that I grow my own Seafoam, I was going to add so much foliage that it would be a riding bush, so the lost detail does not matter too much. In the meantime the Sd.Kfz.234s from Hasegawa and MarS have joined my workbench, and these will benefit from the time and research I spent on this kit.